The challenge when selling smaller properties is to make them feel spacious. That may mean that you need to present your condo differently than how you are currently living in it. Stage a condo to make it feel as spacious as possible with these tips in mind. 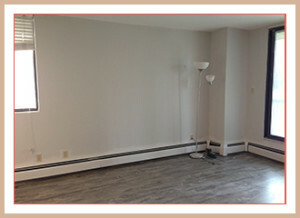 We used large pieces of art in this living room to compliment the size of the walls. A room crammed with large furniture looks smaller. So, if you have filled the condo with large furniture pieces that you enjoy lounging on, but take up too much space, you may want to consider renting staging furniture before you list. 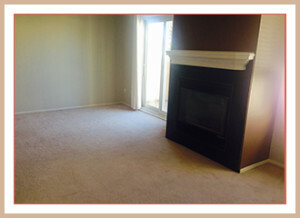 In general, when you stage a condo, furniture should be smaller scale. Additionally, glass top tables are my favourite for allowing light to flow through the room, adding to a sense of spaciousness. Potential buyers want to know that they have enough room to live AND entertain in the condo. That includes knowing that multiple people can move around the space easily. Furniture items like round tables and slipper chairs help to improve that flow by removing hard edges that tend to create barriers. When you stage a small condo, consider ways to make every space useful while keeping traffic flow in mind. Create multifunctional areas and look for creative ways to use space that might otherwise be wasted. For example, turn a nook under the stairs into a spot for a desk or add floating shelves to walls for extra display and storage space. Before: Dining room before staging. After: This large piece of art ties in the colours of the dining area. Are you getting ready to stage a condo to sell in Calgary? I invite you to contact me to schedule your free, no pressure, personalized Home Staging Assessment today. 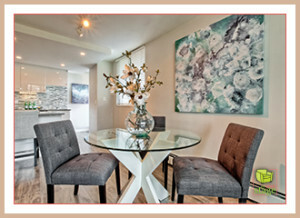 Still curious about the benefits of home staging? Read more about my work and reach out when you’re ready. 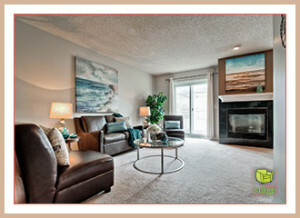 Ask how the Set Your Stage team can help your Calgary condo become SOLD! « How Much Furniture Should be in a Staged Room? This entry was posted on Tuesday, August 16th, 2016 at 5:38 PM	and is filed under Home Staging FAQ. You can follow any responses to this entry through the RSS 2.0 feed. You can skip to the end and leave a response. Pinging is currently not allowed.